In recent years there has been an increasing interest in the design and production of digital interactions for museums (Parry, 2010). This development is often seen in light of a broader change in the role of the museum in modern society, towards an increased emphasis on participation and sharing (Sanderhoff, 2014; Simon, 2010). At the same time, the complexity of relations and demands museums face today often produce tensions, debates, and “museum frictions” (Karp et al., 2006). Political contestations of how exhibitions implicitly make statements about history and identity put pressure on museums to facilitate visitor dialogue and support ways to engage critically with collections. The aim of this paper is to discuss how museums can design for critical encounters with exhibited content, while giving room for different interpretations and attitudes—especially when collections are ideologically contested. Complicating the forum ideal of the contemporary museum (Cameron, 1971), media scholars and professionals have raised concerns about participation through online comments and social media (Coleman 2012; Crockett 2017; Erjavec & Kovacic, 2012; Sunstein, 2017). Backlashes against online comments have taken place in several countries and contexts (Ahva & Hautakangas, 2017; LaBarre 2013; Løvlie et al., 2017), leading WIRED to recently declare “the end of the comments” (Finley, 2015). From a design perspective, this is often seen as a “filtering” problem, emphasizing negative control measures. In this paper, we present an alternative approach, designing a carefully framed user experience in order to positively encourage meaningful user contributions. The case study through which this subject matter is explored is a design experiment that took place at the Museum of Yugoslavia in Belgrade, Serbia, in June 2017 as part of a research project funded by the Horizon 2020 program of the European Union. We developed and tested a prototype called “Monuments for a departed future” using Artcodes—an image recognition technology enabling the use of machine readable markers of one’s own design (Preston et al., 2017)—in order to connect the physical exhibition to a digital experience, aiming to facilitate critical play. The Museum of Yugoslavia, situated in the Serbian capital, has more than 100,000 visitors a year and is the most visited museum in Serbia. The museum is located on the grounds of the former communist leader Josip Broz Tito’s palace, and houses the grave of Tito and his wife in a memorial space named “The House of Flowers.” The museum presents a wide range of artifacts and stories connected with Tito’s life and work, creating an atmosphere of solemn devotion to a man who was a dictator of former Yugoslavia for more than 30 years. Many visitors come to the museum with the main intention to pay their respects. However, the museum aims to adopt a progressive approach, presenting a broad view of the history of the Yugoslav republics. Therefore, the dominating presence of Tito’s legacy presents a challenge. The museum’s strategic plan states “Principles, values, interpretation and even heritage itself are changeable categories which are created in relation to the contemporary context—ideology, politics, the economy and scientific models. Because of this, we encourage CRITICAL THINKING and presentation of diverse views of the same events, documents or data” (Strategic Plan 2014-2018 Museum of Yugoslav History, 2014, caps in the original). There appears to be a potential conflict between the museum’s content and the museum’s aim to encourage critical thinking. Finding ways to more clearly express the museum’s values is a pressing matter, made urgent by the painful memory of the violent breakdown of Yugoslavia and the deep trauma of civil war hanging over the institution. Critical design is an emergent field within human-computer interaction (Dunne, 2006; Gaver et al., 2004), which, rather than serving users’ needs, encourages users to question their everyday lives. Dunne and Raby suggest a strategy of provocative design: “A slight strangeness is the key—too weird and they are instantly dismissed, not strange enough and they’re absorbed into everyday reality” (Dunne and Raby 2001, 63). Much research has been done on mobile experiences for museums. Many studies deal with user experience (Røtne & Kaptelinin, 2013), evaluation methods (Damala, 2006), technology (Rubino et al., 2013) or play in the museum (Beale, 2011). Some designers have created play experiences in order to challenge conventions and perceptions of heritage and museum exhibitions (Kahr-Højland, 2010; McGonigal, 2010; Mees, 2011). Through their extensive collaboration with artist groups such as Blast Theory, Benford and Giannachi (2011) have explored a number of design approaches emphasizing provocation and challenging user experiences. These complex experiences take participants on journeys through space, time, interfaces, and roles. Benford and Giannachi put forward the concept of “trajectories” (Benford et al., 2009) as a useful tool to describe the continuous journeys that participants take through an experience. Mary Flanagan (2009) suggests the concept critical play to describe the challenge of creating compelling play environments using the elaborate concepts of critical thinking. Drawing from art history, she suggests learning from the practice of interventions in performance or activist art. Such interventions typically aim to interfere in or disrupt a specific situation, space, or activity in order to draw attention to certain issues. Flanagan suggests a model for designing for critical play which addresses intervention, disruptions, and social issues as design goals. In the field of museum studies, Andrea Witcomb (2013) has discussed how history museums can enable a form of historical consciousness that encourages critical engagement with the past. Affective strategies of interpretation are to be preferred, she argues, when it comes to dealing with subject matter such as genocide, imprisonment, colonialism, racism, and war. She points to sensorial, embodied museum experiences which may trigger emotional responses, rather than exhibitions that use explicitly rational, information-based content on linear display. By poetically producing unsettling experiences, they require visitors to engage both emotionally and intellectually. While Witcomb’s study focuses on physical installations, we are interested in exploring how similar experiences could be facilitated by a design which links physical installations to a digital smartphone app. The study at hand applies a research through design methodology (Roedl & Stolterman, 2013; Zimmerman et al., 2007), to study the ideologically contested collections of the Museum of Yugoslavia. Applying a critical design approach, we explore how to facilitate critical play in the context of the Museum of Yugoslavia’s presentation of Yugoslav history. Our collaboration with the Museum of Yugoslavia was initiated by one of our partners in the research project, a design studio based in Belgrade. Together, we set up a two-day workshop with representatives from the museum from March 22-23 2017, in order to discuss ideas for playful physical-digital experiences at the museum. In the following months, we engaged in a design process where the Belgrade design studio and our team developed a number of concepts in close collaboration, resulting in two prototypes, one of which was the Monuments for a Departed Future. Two sessions were carried out to test the result of the prototyping process; one with four art history students from University of Belgrade, and one with a group of nine experts (researchers, designers, and museum professionals) from the Horizon 2020 project. 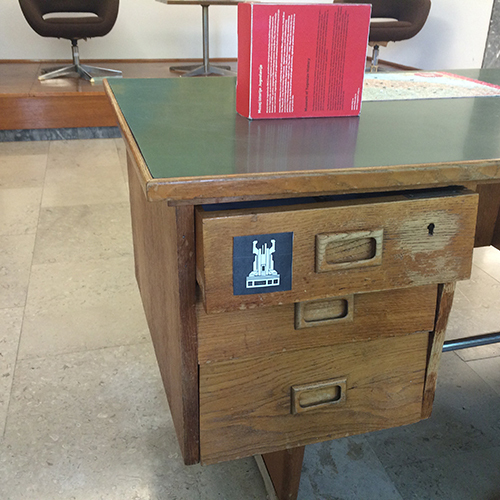 The student testers were recruited through the local design studio. The first session took place on June 19th, followed by semi-structured qualitative interviews. 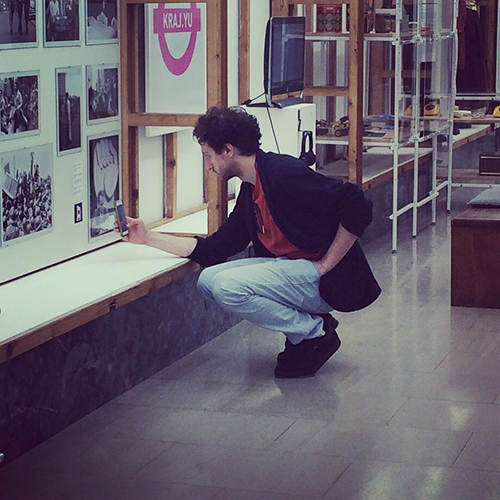 The interviews focused on the tester’s experiences of using the prototype within the museum environment, and were carried out according to the phenomenological interviewing method (Bevan, 2014). The reason for choosing this method was to gather data that when analyzed could provide an understanding of how testers made meaning of their experience (Jackson, 1998). The second test took place on June 28th as part of a workshop with partners in the research project, and was followed by a group discussion. Audio from the interviews was recorded and transcribed for analysis, along with written feedback statements from each of the experts. We have also done a qualitative analysis of 105 answers that the test participants submitted to questions in the app. In our work with the design experiment, we searched for a theme that would serve as a critical point of entry to the Museum of Yugoslavia and its exhibitions, and which would open up a range of perspectives on the history of the former country. We found a suitable topic in the socialist monuments placed all over former Yugoslavia—internationally known as the “Spomeniks” (Surtees, 2013). These monuments are sites of ideological battles, and offer rich possibilities of interpretations. The subject matter of the monuments was discussed and further developed in a second workshop at the museum, after which we developed a prototype app. The “Spomeniks” were built during the period from 1960 to the early 1980s, most often to serve as memorials of the Second World War. Remembering the victims of the war and the fight against fascism was an important part of the cultural and political messaging of socialist Yugoslavia (Putnik, 2016). 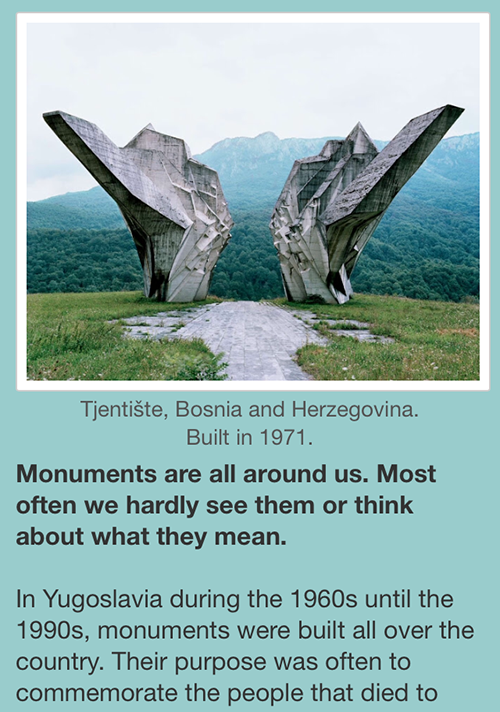 The monuments have a distinct aesthetic style; a result of the turn to a less radical socialist politics in the 1950s that produced an artistic freedom in the search for a new Yugoslav identity. During the socialist era, they were popular sites of tourism, as well as school excursions. This shifted radically during the 1990s, when the turn to nationalism brought a change in the perception of the monuments, which were now seen as symbols of a conflicting and ideologically undesired past. This lead to their destruction or abandonment (Etkind, 2004; Potkonjak & Pletenac, 2007). During the last decade, the monuments have been rediscovered by an international audience through the work of Belgian photographer Jan Kempenaers (2010). His eerie photographs were soon spread globally over blogs, websites and social media with headlines such as “alien art,” “abandoned monuments,” and “the end of history” (Putnik, 2016). The international fame of the memorials also led to increased recognition of the monuments domestically. While the Museum of Yugoslavia hosted a touring exhibition about the Spomeniks in 2016, they are not represented in the permanent exhibition at the museum. In order to give these forgotten relics a physical presence in the museum, we decided to use markers which visually represented the shape of the monuments (Figure 1). These markers simultaneously worked as Artcodes (Preston et al., 2017) that could be scanned with a smartphone, triggering a digital interaction (Figure 2). Thus, the Artcode markers served as an added layer in tension with the exhibited collection. The intention was that this tension would work as a trigger for curiosity and critical reflection. The markers were placed inside the existing exhibition at the museum such that they were not always easy to spot, and sometimes even hidden intentionally (Figure 3). The app provided clues on how to find each marker. The purpose was both to introduce a playful activity of searching for the markers inside the museum space, and to let the placement of the markers reflect that many of the monuments are in remote locations, and hidden from public consciousness. Each marker served as an entry point to one of the existing monuments as well as to a specific theme relating to their history. While these themes were not explicitly communicated in the physical exhibition, there did exist connections between the objects on display and the virtual content of the app. In this way, the monuments both communicated with and intervened with the current exhibition. The app included eight such themes: 1) Monuments and meaning; 2) Style and ideology; 3) War, death, and victims; 4) Controversy and contested heritage; 5) Tourism and play; 6) Abandonment and destruction; 7) History and the generational gap; and 8) The future. After scanning a marker, the user first encountered a quote related to the theme (Figure 4). Then the user was presented with an image of the monument and a short theme text (Figure 5). 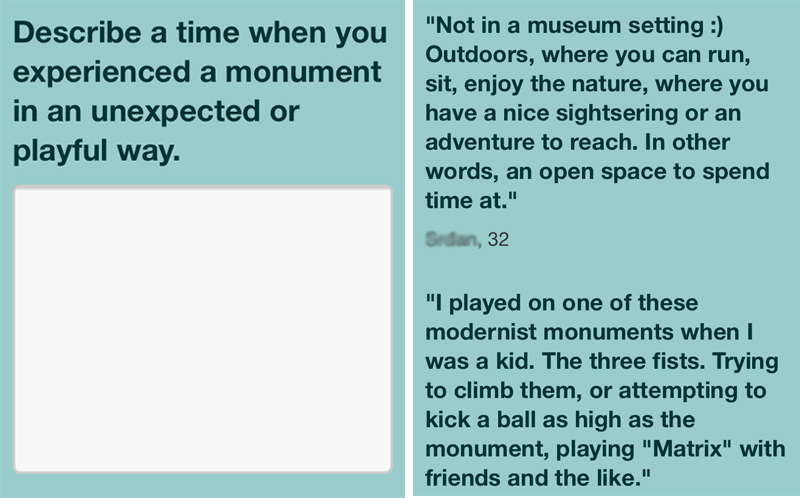 At this point the user could choose to get more detailed information about the monument, take on a playful challenge, or proceed to answer a question. For each marker scanned, the app would add the corresponding monument to the user’s collection. After scanning all eight monuments, the user would receive a reward in form of a digital map of the geographical locations of the monuments. Building on Witcomb’s (2013) ideas on affective curatorial strategies, which encourages critical engagement with a historical topic, we presented the users with a series of poetic provocations. Our goal with these parts of the design was to invite a playful mindset which could trigger visitors’ imaginations, build attentiveness, evoke emotions, as well as facilitate reflection. The provocations were presented as playful challenges on the backside of a “challenge card” inside the app (Figure 6). They would prompt participants to put themselves in a specific state of mind, using their imagination and their bodies to interact with the museum environment. These challenges ranged from being lighthearted and playful to more emotionally challenging. Furthermore, for each theme the participants were presented with a question which they could answer inside the app (Figure 7). The purpose was to provoke reflections on the different topics addressed, and to link the experience at the museum with personal life outside of it. After submitting an answer, it was possible to view answers from other participants. The students viewed interacting with the app in the museum as a very personal experience. They interpreted the challenge cards and questions as a way to make a personal and emotional connection with the historical content. One of the interviewees described the experience as an “historical/emotional roller-coaster.” In this way, the experience became “bigger”—not just about learning history, but to some degree also about connecting with challenging aspects of life such as death, conflict, and forgiveness. Using play and imagination were also seen as ways to “communicate with the space” and put the participant in an “active role,” as well as challenging them to think for themselves. They saw the questions in the app both as ways to reflect and contribute, but also as concrete reminders that people have diverse perspectives on objects. In sum, the answers to the questions affirms the findings from the interviews, indicating that the design experiment succeeded in facilitating reflection and emotional engagement among the participants, although a distancing irony or ambiguity were also expressed. However, it is important to take into account that being students of art history as well as researchers, designers, and museum professionals, the participants showed a great respect for the museum as an institution, something which is very likely to effect the outcome of the test sessions. The main takeaway from our experiment is that by using poetic provocations in the form of questions and playful challenges, it is possible to facilitate reflections and emotional responses that help visitors connect more deeply with an exhibition. A foundation can in this way be set for critical engagement and meaningful user contributions, not least when it comes to dealing with contested exhibitions. However, there are difficulties to consider. We encountered two main challenges: Firstly, the participants expected the digital experience to be closely connected with the physical objects on display. The idea of intervening in or interrupting an exhibition would need to be more clearly communicated in order to be accepted. Secondly, when using affective strategies, it requires visitors to commit to the intellectual and emotional labor involved. According to Witcomb, “visitors require a sense of curiosity, a willingness to engage with a certain opaqueness or to accept that meaning is not reduced to information or instantly available” (Witcomb, 2013, 267). This resembles what Csikszentmihalyi (1975, 10) terms an autotelic activity, something which “require formal and extensive energy output on part of the actor, yet provide few if any conventional rewards.” As we know from visitor studies, people going to a museum have very different motivations and learning styles (Falk & Dierking, 2012). They also have different relationships to experiencing and expressing emotions. Thus pace, duration, and depth need to be carefully calibrated when designing a possibly unsettling experience, especially when considering that not all museum visitors are students of art history nor researchers, designers, or museum professionals. We suggest that in order to learn how to better design for critical engagement through affect, one could build on Benford and Giannachi’s concept of trajectories (2011). Working with affect trajectories—a way to describe the inner journeys participants take through an experience—could be a useful tool in order to come to a deeper understanding of how participants react to unsettling or emotionally challenging experiences. This would help to identify points of transitions and traversals between different emotions or states of mind during a specific experience. Similar to Benford and Giannachi’s distinction between canonical and participant trajectories, affect trajectories would need to distinguish between the designer’s intentions and the actual emotional journeys experienced by the participants, which could be mapped using data from interviews, self-tracking, and written comments. We hope to explore this possibility in further research. This project has received funding from the European Union’s Horizon 2020 research and innovation programme under grant agreement No 727040 (the GIFT project). We would like to give a special thank you to Bogdan Spanjevic, the company NextGame, as well as Museum of Yugoslavia for all the help and collaboration. The Artcodes for the monuments were designed by Raquel Meyers (http://www.raquelmeyers.com/) who generously assisted in the development of the prototype. Ahva L., & M. Hautakangas. (2017). “Understanding ‘constructive’ through Action Research.” Conference presentation presented at the Nordmedia 2017: Mediated Realities – Global Challenges, Tampere, Finland, August 17. Beale, K. (2011). Museums At Play – Games, Interaction and Learning. Edinburgh: MuseumsEtc. Benford, S. & G. Giannachi. (2011). Performing Mixed Reality. Cambridge, MA: MIT Press. Benford, S., G. Giannachi, B. Koleva, & T. Rodden. (2009). “From Interaction to Trajectories: Designing Coherent Journeys Through User Experiences.” In Proceedings of the SIGCHI Conference on Human Factors in Computing Systems. CHI ’09. New York, NY, USA: ACM. 709-18. Bevan, M. T. (2014). “A Method of Phenomenological Interviewing.” Qualitative Health Research 24(1), 136-44. Birchall, C., & S. Coleman. (2015). “Creating Spaces for Online Deliberation.” In S. Coleman & D. Freelon (ed.). Handbook of Digital Politics. Northampton, MA: Edward Elgar Publishing. 264-80. Boyd, D. (2012). “The Politics Of ‘real’ Names.’” Communications of the ACM 55(8), 29-31. Cameron, D. F. (1971). “The Museum, a Temple or the Forum.” Curator: The Museum Journal 14(1), 11-24. Canter, L. (2013). “The Misconception of Online Comment Threads.” Journalism Practice 7(5), 604-19. Coe, K., K. Kenski, & S. A. Rains. (2014). “Online and Uncivil? Patterns and Determinants of Incivility in Newspaper Website Comments.” Journal of Communication 64(4), 658-79. Coleman, E. G. (2012). “Phreaks, Hackers, and Trolls: The Politics of Transgression and Spectacle.” In M. Mandiberg (ed.). The Social Media Reader. New York: New York University Press. 99-119. Crockett, M. J. (2017). “Moral Outrage in the Digital Age.” Nature Human Behaviour 1, 769-71. Damala, A. (2006). “A Taxonomy for the Evaluation of Mobile Museum Guides.” In Proceedings of the 8th Conference on Human-Computer Interaction with Mobile Devices and Services, Mobile HCI 2006, Helsinki, Finland, September 12-15, 2006. Dunne, A. (2006). Hertzian Tales: Electronic Products, Aesthetic Experience, and Critical Design. Cambridge, MA: MIT Press. Dunne, A. & F. Raby. (2001). Design Noir: The Secret Life of Electronic Object. Basel, Switzerland: Birkhauser. Elgesem, D., & T. V. Nordeide. (2016). “Anonymity and Tendentiousness in Online Newspaper Debates.” In M. Eide, H. Sjøvaag, & L. O. Larsen (ed.). Journalism Re-Examined: Digital Challenges and Professional Reorientations. Lessons from Northern Europe. Bristol: Intellect Books. Erjavec, K., & M. P. Kovacic. (2012). “‘You Don’t Understand, This Is a New War!’” Analysis of Hate Speech in News Web Sites’ Comments.” Mass Communication and Society 15(6), 899-920. Etkind, A. (2004). “Hard and Soft in Cultural Memory: Political Mourning in Russia and Germany.” Grey Room 16, 36-59. Falk, J. H., & L. D. Dierking. (2012). The Museum Experience Revisited. London, England: Routledge. Gaver, W. W., J. Bowers, A. Boucher, H. Gellerson, S. Pennington, A. Schmidt, A. Steed, N. Villars, & B. Walker. (2004). “The Drift Table: Designing for Ludic Engagement.” In CHI ’04 Extended Abstracts on Human Factors in Computing Systems. CHI EA ’04. New York, NY, USA: ACM. 885-900. Jackson, P. W. (1998). John Dewey and the Lessons of Art. New Haven, CT: Yale University Press. Kahr-Højland, A. (2010). “EGO-TRAP: A Mobile Augmented Reality Tool for Science Learning in a Semi-Formal Setting.” Curator: The Museum Journal 53 (4). 501-09. Karp, I., C. A. Kratz, L. Szwaja, & T Ybarra-Frausto, eds. 2006. Museum Frictions: Public Cultures/Global Transformations. Duke University Press. Kempenaers, J. (2010). Spomenik. Amsterdam: Roma Publications. Kies, R. (2010). Promises and Limits of Web-Deliberation. New York: Palgrave. Kraut, R. E, P. Resnick, S. Kiesler, M. Burke, Y. Chen, N. Kittur, J. Konstan, Y. Ren, & J. Riedl. (2011). Building Successful Online Communities: Evidence-Based Social Design. Cambridge, MA: MIT Press. Løvlie, A. S., K. A. Ihlebæk, & A. O. Larsson. (2017). “User Experiences with Editorial Control in Online Newspaper Comment Fields.” Journalism Practice 0, 1-20. McGonigal, J. E. (2010). Reality Is Broken: Why Games Make Us Better and How They Can Change the World. London: Penguin Books. Mees, A. (2011). “Art Heist, 2010: An Interactive Adventure by Coney.” In K. Beale (ed.). Museums at Play: Games, Interaction and Learning. Edinburgh: MuseumsEtc, 84-95. Muddiman, A. & N. J. Stroud. (2017). “News Values, Cognitive Biases, and Partisan Incivility in Comment Sections.” Journal of Communication 67(4), 586-609. Parry, R. (2010). Museums in a Digital Age. London & New York: Routledge. Potkonjak, S. & T. Pletenac. (2007). “City and Ideology: ‘Cultures of Oblivion’ on the Example of the Town of Sisak.” Studia ethnologica Croatica 19(1), 171-97. Preston, W., S. Benford, E. Thorn, B. Koleva, S. Rennick-Egglestone, R. Mortier, A. Quinn, J. Stell, & M. Worboys. (2017). “Enabling Hand-Crafted Visual Markers at Scale.” In Proceedings of the 2017 Conference on Designing Interactive Systems. DIS ’17. New York, NY, USA: ACM. 1227-37. Putnik, V. (2016). “Second World War Monuments in Yugoslavia as Witnesses of the Past and the Future.” Journal of Tourism and Cultural Change 14(3), 206-21. Roedl, D. J., & E. Stolterman. (2013). “Design Research at CHI and Its Applicability to Design Practice.” In Proceedings of the SIGCHI Conference on Human Factors in Computing Systems. CHI ’13. New York, NY, USA: ACM. 1951-1954. Røtne, O., & V. Kaptelinin. (2013). “Design Choices and Museum Experience: A Design-Based Study of a Mobile Museum App.” In Proceedings of the 6th Latin American Conference on Human Computer Interaction – Volume 8278. CLIHC 2013. New York, NY, USA: Springer-Verlag New York, Inc. 9-13. Rowe, I. (2015). “Civility 2.0: A Comparative Analysis of Incivility in Online Political Discussion.” Information, Communication & Society 18(2), 121-38. Rubino, I., J. Xhembulla, A. Martina, A. Bottino, & G. Malnati. (2013). “MusA: Using Indoor Positioning and Navigation to Enhance Cultural Experiences in a Museum.” Sensors (Basel, Switzerland) 13(12), 17445-17471. Ruiz, C., D. Domingo, J. L. Mico, J. Diaz-Noci, K. Meso, and P. Masip. 2011. “Public Sphere 2.0? The Democratic Qualities of Citizen Debates in Online Newspapers.” International Journal of Press-Politics 16(4), 463-87. Sanderhoff, M. (ed.). (2014). Sharing Is Caring: Openness and Sharing in the Cultural Heritage Sector. Copenhagen: National Gallery of Denmark. Santana, A. D. (2014). “Virtuous or Vitriolic.” Journalism Practice 8(1), 18-33. Sobieraj, S., & J. M. Berry. (2011). “From Incivility to Outrage: Political Discourse in Blogs, Talk Radio, and Cable News.” Political Communication 28(1), 19-41. “Strategic Plan 2014-2018 Museum of Yugoslav History.” (2014). Witcomb, A. (2013). “Understanding the Role of Affect in Producing a Critical Pedagogy for History Museums.” Museum Management and Curatorship 28(3), 255-71. Wright, S., & J. Street. (2007). “Democracy, Deliberation and Design: The Case of Online Discussion Forums.” New Media & Society 9(5), 849-69. Zimmerman, J., J. Forlizzi, & S. Evenson. (2007). “Research Through Design As a Method for Interaction Design Research in HCI.” In Proceedings of the SIGCHI Conference on Human Factors in Computing Systems. CHI ’07. New York, NY, USA: ACM. 493-502. Ryding, Karin and Løvlie, Anders Sundnes. "Monuments for a departed future: Designing for critical engagement with an ideologically contested museum collection." MW18: MW 2018. Published January 10, 2018. Consulted .